Rat and mouse behavior patterns are very different. In response to university studies conducted in England, our aegis rat bait stations were designed specifically to cater to the feeding habits of rats. Studied conclude that rats prefer to feed in tunnels. so it’s no surprise that aegis rat bait station’s double-tunnel design improved rodenticide consumption by up to 57% over other rat bait stations on the market. Rats are more likely to enter the tunnels of aegis rat bait stations, which are made of heavy-duty polypropylene. Unique patented, double-quartered locking bards makes Aegis tamper resistant. One universal key open all Aegis products. No need for special tools or multiple keys. Rotating hinge, won’t crack or break when opened in cold weather. Vertical and horizontal habiting rods secure bait inside the station and away from moisture. 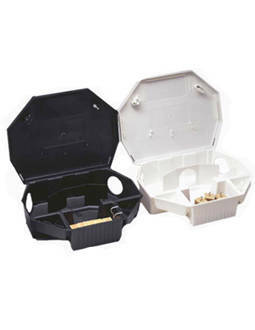 Dimensions (in inches): length 13 9/16, Width: 10 5/8 (including hinge).Height (lid closed): 3 ½, Height (lid open): 3 1/8.